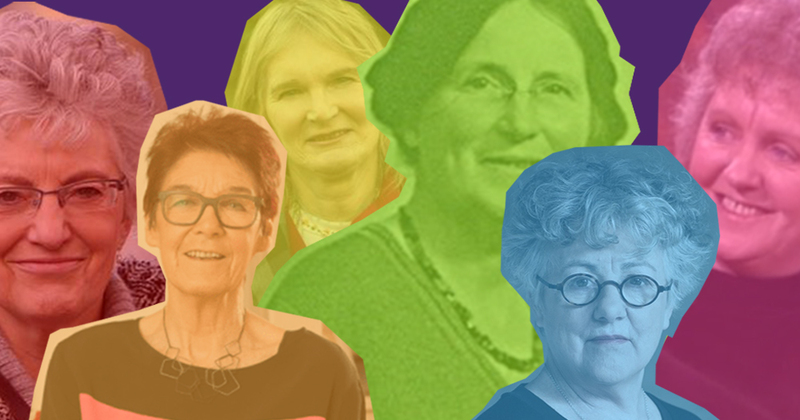 Irish women are some of the fiercest in the world, many have made an indelible mark on our lives through their compassionate and altruistic contribution to society. News 8 March, 2018 . Written by Katie Donohoe. In the fight for equal rights and gender recognition, queer women have often been front and centre, fighting for bodily autonomy, the right to vote, tackling suicide in the LGBT+ community, fighting for marriage equality: this list goes on and this one is not exhaustive. There are hundreds if not thousands of queer women, without which Ireland would be a very different place. Here are but a few whose contributions are worthy of a place in the history books. Legend has it that a younger nun named Darlughdach was St Brigid’s “anam cara” or soul friend. The two brought art, education and spirituality to early medieval Ireland. Some say that Brigit and Darlughdach are lesbian saints. Dr Kathleen Lynn was a prominent figure in the Suffragette movement. Kathleen was a member of the executive committee of the Irish Women’s Suffragette and Local Government Association from 1903 until 1916. She joined the Irish Citizen Army and was the chief medical officer during the 1916 Easter Rising. She described herself as “a Red Cross doctor and a belligerent” when she was arrested. She was imprisoned in Kilmainham Gaol with her comrades Countess Markievicz, Molony and Madeleine ffrench-Mullen. Madeleine was a member of Inghinidhe na hÉireann and wrote for the newspaper Bean na hÉireann. Madeleine was a lieutenant in the Irish Citizen Army and in the 1916 Rising was stationed at the Garrison of Stephen’s Green/College of Surgeons with Countess Markievicz, Nellie Gilford and others. Her duties included overseeing the commandeering of vehicles, removing civilians from the area, guarding the entrances to the Green and tending the wounded. She was first imprisoned in Kilmainham Gaol and then transferred to Mountjoy. She devoted her life’s work to try and improve the living conditions of the poor. She co-founded St. Ultan’s, the first children’s hospital in Dublin with her partner Dr Kathleen Lynn, working tirelessly in its day to day running. Many of her books deal with issues of female agency and sexuality in ways that were new and radical at the time. Her 1936 novel, Mary Lavelle, was banned in Ireland and Spain, while The Land of Spices was banned in Ireland upon publication. Kate O’Brien’s determination to encourage a greater understanding of sexual diversity — several of her books include positive gay/lesbian characters — make her a pioneer in queer literary representation. Joni Crone came out as a lesbian on the Late Late show in 1980, two years before Declan Flynn was murdered in Fairview Park, 13 years before homosexuality was decriminalised in Ireland. She was there to talk about the need for law reform and to give insight into the horror stories she heard on the Lesbian Line. She returned from London in the 1970s and began the fight for civil rights for LGBT+ people in Ireland. Her latest play Anna Livia Lesbia was written as a response to the erasure of the gay rights movement in Ireland in the 70’s and 80’s in the Marriage Referendum narrative. Dr Lydia Foy is widely regarded as a pioneer for trans rights. In 1997, Foy began her legal fight for gender recognition, after the Registrar General refused to issue her with a new birth certificate recognising her true gender in 1993. She fought for two decades, and ultimately, the case forced the Government to introduce gender recognition legislation. Last year, she won the prestigious Citizen’s Prize from the European Parliament in Brussels. Independent TD Katherine Zappone and her wife Ann-Louise Gilligan campaigned fiercely for years that led to the marriage equality referendum. Zappone made headlines when she popped the question live on RTÉ to Ann-Louise, saying she was “feeling emotional from the top all the way down to my toes”. The couple are also co-founders of An Cosán, an organisation in Tallaght, which offers adult education among other services, to women from disadvantaged areas. In a historic first, Minister Katherine Zappone became the first openly lesbian member of the Irish Cabinet and she is continuing her work most recently lending her voice to the Repeal the 8th movement and launching LGBT Ireland’s 3 years Strategic Plan where she said: “Our work is not yet done”. Wife of Katherine Zappone, Ann Louise Gilligan fought tirelessly to marriage equality in Ireland, their court case against the state began a decade long debate which resulted in the referendum. She was an advocate of education and founded Ireland’s largest community education organisation. “She also was a woman who changed Ireland, who fought against injustice and won on all our behalf. McCafferty was a founding member of the Irish Women’s Liberation Movement. Her journalistic writing on women and women’s rights reflected her beliefs on the status of women in Irish society. In 1971, she travelled to Belfast with other members of the Irish Women’s Liberation Movement in order to protest the prohibition of the importation and sale of contraceptives in the Republic of Ireland. Garry Hynes is a co-founder of the Druid Theatre Company and was Artistic Director at the Abbey Theatre from 1991 to 1994. Hynes directed the critically acclaimed DruidSynge which has been described by Charles Isherwood of The New York Times as “the highlight not just of my theatre-going year but of my theatre-going life”. In 1998 she won the Tony Award for Direction for The Beauty Queen of Leenane, the first woman to receive the award. On 15 June 2006, she was awarded the Freedom of the City of Galway, its highest bestowed honour. In 2015, Grainne took home The GALA Award for Volunteer of Year, and for good reason! Longtime feminist and LGBT activist, former chairwoman for Marriage Equality and co-director of the Yes Equality campaign, Gráinne Healy was instrumental in securing a Yes vote in May 2016. Along with progressing the LGBT movement, she has dedicated her life to campaigning for women’s rights in Ireland, including reproductive health rights, violence against women, prostitution and trafficking and anti-poverty issues. Feminist and lesbian activist, Ailbhe Smyth has been involved in radical politics in Ireland for over four decades. Smyth is a spokeswoman and convenor for the Coalition to Repeal the Eighth Amendment. She is also a founding member of Marriage Equality, convenor of Feminist Open Forum, an organiser for Action for Choice, a board member of Equality and Rights Alliance and is the former Chair of the National LGBT Federation. Smyth received the ‘Lifetime Achievement’ award at the Galas 2015, Ireland’s LGBT Awards Ceremony. Una Mullally is an award-winning journalist with the Irish Times, author and broadcaster. She contributes opinion pieces to The Guardian and has also written for Granta. She writes two weekly columns for the Irish Times covering areas including Irish and global politics, social justice issues, LGBT rights issues, feminism and technology, and also writes features and interviews. She co-founded the award-winning Irish Times Women’s Podcast and presents and produces television programmes. Her first book In The Name Of Love was a critically acclaimed oral history of the movement for marriage equality in Ireland. She was named Journalist of the Year (2015) at the Irish GALAS LGBT Awards, was presented with the Praeses Elit Award (2016) from Trinity College Dublin, and the Foy-Zappone Award (2016) from University College Dublin. She co-founded the touring queer spoken word event Come Rhyme With Me and in 2016 was awarded a residency at Centre Culturel Irlandais in Paris where she worked on a long-form poetry project. She is currently the chair of the LGBTI Youth Strategy and is in the process of writing her second book which is a collection of stories, essays, poetry and photography around the movement for reproductive rights in Ireland. It is set for release in April. 8 March, 2018 . Written by Katie Donohoe.